The recent publication of Bruce Chatwin’s letters in the volume entitled Under the Sun received subtantial coverage in at least two reviews, both of which also put Chatwin on the cover. 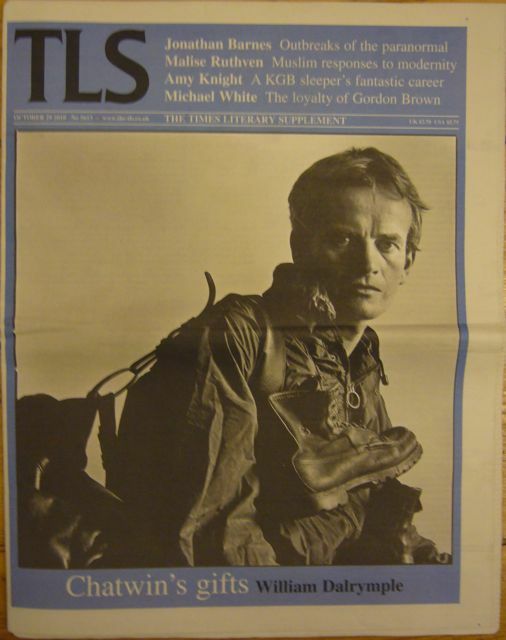 The cover of the TLS (29 Oct. 2010) features a beautiful photograph of Chatwin taken in 1982. He seems to be dressed for the outdoors, wearing what looks like a windbreaker, carrying a dark and heavy rucksack on his shoulder and a pair of walking boots strung around his neck. He looks serious, focused, and, if not impatient with the photographer, at least as if his mind and body were almost somewhere else already. His body, filling the right-hand side of the picture, is moving out of the picture and into the light. Bruce Chatwin on the cover of the 29 Oct. 2010 issue of the TLS (picture copyrighted to Snowdon/Vogue/Camera Press). 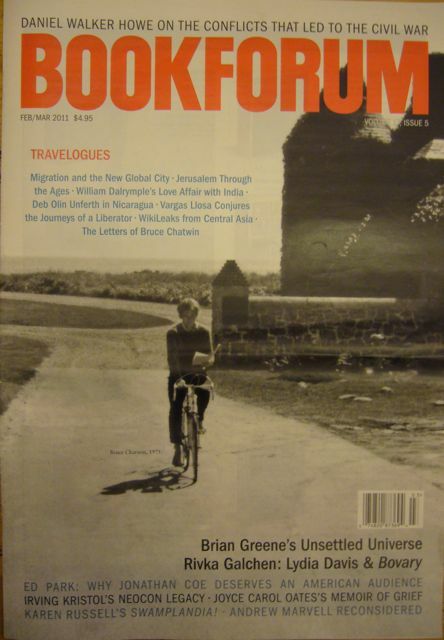 The cover of Bookforum (Feb./March 2011) shows Chatwin bicycling, the caption informs us, “on Fishers Island, NY, while absorbed in a book, 1975.” It, too, is a good photograph, less intimate and less structured than the above picture, but more humorous. It is slightly out of focus and this makes it difficult to tell whether his eyes are on the book or on the road, but he looks concentrated, and reading a book while riding a bicycle seems like the most natural thing in the world. Bruce Chatwin on the cover of the Feb./March 2011 issue of Bookforum (picture copyrighted to Elizabeth Chatwin & Viking). And yet, though I like both pictures, I wonder whether Chatwin is concentrating on his book or on his bike, and I wonder why he is wearing a windbreaker indoors and what he is wearing on his feet, or if he is wearing anything at all. This entry was posted in Bruce Chatwin and tagged Bruce Chatwin. Bookmark the permalink.